A team of four Purdue students, including two from AAE, is hoping a pair of competitions help springboard a startup. The mission of “FlykeART” is to offer innovative solutions through the Internet of Things to enhance the in-flight experience for flight attendants and passengers while allowing airlines to significantly reduce their operating costs. 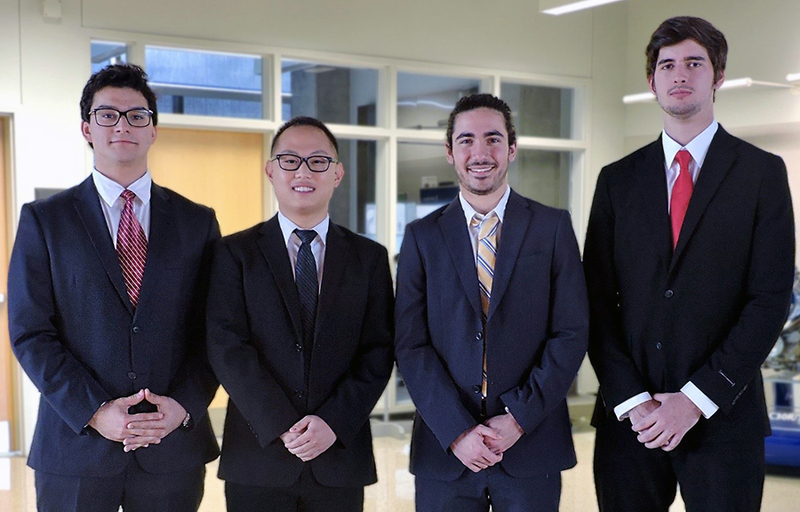 The group entered the Airbus “Fly Your Ideas” competition and the Business Model Competition, offered through Purdue’s Burton D. Morgan Center for Entrepreneurship. The students — Juan Pablo Mascaretti, a senior in AAE and Economics; Yuhan Roh, a senior in AAE; Juan Ramirez, a senior in mechanical engineering; and Federico Brandt, a junior in computer engineering — are working toward designing an aircraft galley cart for an optimized food serving system that operates through data-driven interactions. Nothing similar exists in the current market, the team says. The Airbus competition, in partnership with UNESCO, had 2,825 students register as part of 646 active teams in Round 1. The top 50 teams will advance to Round 2 in December. Teams are competing for a share of about $50,000. The competition challenged students to innovate for the future of aerospace and focus on using the latest digital technologies to create “smart solutions for a safer, cleaner and better-connected world,” according to its website. Teams chose from six challenge categories: Cyber security, Internet of Things, artificial intelligence, mixed reality, electrification, and data services. Purdue’s competition has three categories: Business to Business, Social innovation/non-profit, and Business to Customer. Roh says Purdue’s group liked the business model competition because “we thought it’d be really good for us to structure our business plans and the project goals,” while the Airbus competition is more for making a prototype and delivering the technical details about the product for the customers. On a recent international flight, Mascaretti thought about how much an airplane’s external design has changed over the years but the interior and the service has not made similar improvements, he says. So he began thinking about a system that would improve the passenger experience. Upon returning to campus in August, Mascaretti reached out to Roh and told him of an idea to create an automated cart. They brought in Ramirez, who has experience with 3D printing and manufacturing. After meeting weekly, though, the idea transformed. Federal battery regulations prevented a robot operating inside an aircraft, Mascaretti says, so the team explored new ideas. 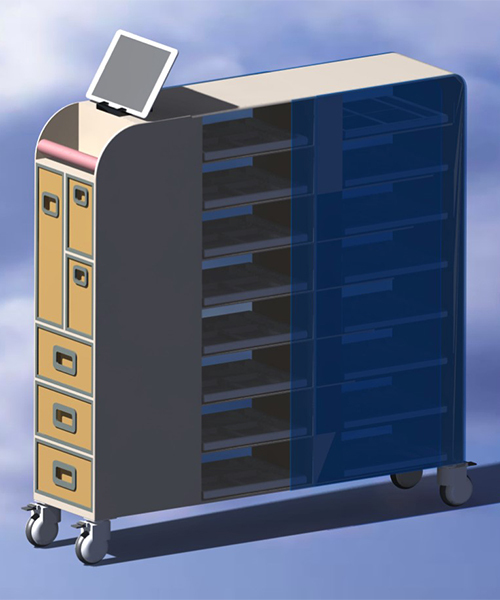 “We still had this notion in mind that the current trolleys were too inefficient. Innovation was required,” Mascaretti says. After reading an article about an incident on Aerolineas Argentinas Flight 1303 in October — when severe turbulence caused injuries, some allegedly from galley carts — Mascaretti realized the importance of redesigning carts to minimize the risk of accidents on board. Ultimately, the team proposed a lighter, slimmer cart that would address key problems offered from discussions with airline companies: Improving customer service and reducing operating costs. For one, a redesigned cart could be less of an injury threat to people on board. For the other, based on the team’s projections, a large airline could save $100 million in fuel per year, just by using lighter carts. “The food weight should not be reduced, but if we change the material of the cart and modify the structure, we should be able to save half the weight of the way it is now,” Roh says. But the team’s intent isn’t only to modify carts. There’s also a key data piece to their idea.